Utility for checking ink levels and printer status. Is there a better alternative to InkLevel? Is InkLevel really the best app in System category? Will InkLevel work good on macOS 10.13.4? InkLevel is a utility for checking ink levels and printer status. 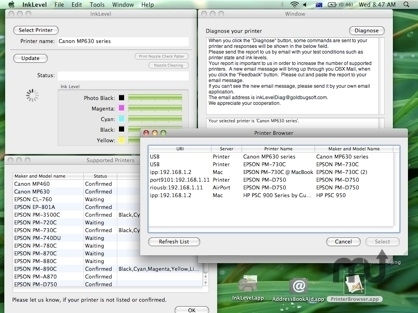 You can check ink levels and printer status of Canon, EPSON and HP printers that are connected to your USB port or AirPort base station. And a network printer that is discovered by Bonjour is also available. This is probably only software that can show ink levels of your printer connected to AirPort base station. Also this is useful when you are using multiple printers of different vendors. Tested in OS X 10.7. InkLevel needs a rating. Be the first to rate this app and get the discussion started!